Often called a “great example” of the corner neighborhood bar, you are sure to enjoy yourself upon walking through our door. Come on in and experience the pleasures. Touting what some consider to be the best selection of whiskey, tequila and scotch in Lancaster, along with a wonderful selection of wines and a very unique menu, you can indulge yourself in many different ways. We’re a WiFi hotspot and there is a TV in every corner, 19 beers on tap, plenty of bottled beers and incredible bartenders who make just about any mixed drink you desire. If you want to be noticed – or if you just want a place to escape – Brendee’s Irish Pub is for you. 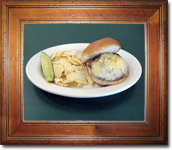 Start with a 100% Angus burger cooked to order and top it with mashed potatoes and Irish Dubliner cheese. An awesome combination for your taste buds.